Bernhard Riemann made profound, far-sighted discoveries with lasting consequences for mathematics and our understanding of space, gravity, and time. Riemannian geometry completely reformed the field of geometry and became the mathematical foundation of Einstein’s general theory of relativity. Finding a proof or disproof of the Riemann hypothesis continues to be the greatest, deepest, unsolved problem in number theory – the search for a solution has become the holy grail of mathematics. Another of Riemann’s innovations, Riemann surfaces, made a strong link between topology and complex function theory. Riemann was the first person to rigorously define the integral. Georg Friedrich Bernhard Riemann was born on September 17, 1826 in the rural village of Breselenz, in northern Germany. He was the second of his parents’ six children. His mother was Charlotte Ebell, the daughter of a government employee in the city of Hanover. His father was Friedrich Bernhard Riemann, a Lutheran pastor. Life was harsh for the family – they lived in near poverty. In accordance with Lutheran practice, a solemn mood pervaded the home at all times. Although it was austere, Bernhard’s home was also loving and caring. The threat of death from tuberculosis was present in the very air the family breathed. Their diet and nutrition was poor and young Bernhard was plagued with persistent constipation. Although his brother and his four sisters reached adulthood, they all, except for his sister Ida, died at relatively young ages. Bernhard grew up 10 miles from Breselenz in the tiny village of Quickborn, where his father became the pastor when Bernhard was a toddler. Bernhard’s parents believed the most important thing they could give their children was a solid education. Bernhard attended some classes in the village school, but most of his education came from homeschooling with his father. In his earliest years Bernhard was interested in history, particularly ancient history. But it was always clear that this stuttering, painfully shy boy had one exceptional talent: mathematics. His father enlisted a local teacher by the name of Schultz to teach 10-year-old Bernhard arithmetic and geometry, but soon Bernhard was teaching his teacher! In the spring of 1840, age 13, Bernhard was sent to live with his maternal grandmother in the city of Hanover. There he attended the Tertia des Lyceums Gymnasium, a school whose students were expected to go to college. Bernhard was behind his classmates in most subjects, and he suffered terribly from homesickness. Hanover was about 90 miles from Quickborn – too far for him to travel home to see his cherished family. Despite his homesickness, he worked hard and made good progress academically. Johanneum Gymnasium as it looked when Bernhard Riemann attended it. Bernhard’s grandmother died two years after Bernhard arrived in Hanover to live with her. Bernhard moved again, this time to the Johanneum Gymnasium in the small city of Lüneburg. Lüneburg was about 45 miles from Quickborn, close enough for him to walk home for vacations. These treks strained his frail body badly, but knowing he could get home to Quickborn took the edge off his appalling homesickness. His mother agonized over his safety and health when he was on the road. More than half of Bernhard’s school day was devoted to Latin, Greek, Hebrew, and German, but Mathematics formed a significant part of his curriculum: his ability in this subject was outstanding. One of his teachers, Herr Schmalfuss, recognized Bernhard’s flair and began lending him advanced college-level mathematics texts, including works by Leonhard Euler and Adrien-Marie Legendre. The first time he did this, Herr Schmalfuss was astonished when Bernhard, after just a few days, returned the book to him. He questioned Bernhard about the book’s themes, and it became clear that his student truly had read and understood mathematical material that a typical advanced college student would have taken weeks or months to absorb. In addition to his love of mathematics, Bernhard was also passionate about his religion. A devout Lutheran, he decided to study Theology and Philology at the University of Göttingen, hoping to follow in his father’s footsteps and become a pastor. This was a curious decision, because Bernhard was introverted, terrified of public speaking, and generally uncomfortable around people. On the other hand, his father was his hero, and trying to emulate his hero was probably instinctive. Interestingly, Leonhard Euler was also the son of a Protestant pastor and also seemed destined to join the clergy. 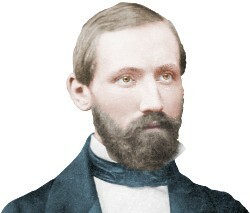 Bernhard Riemann entered Göttingen in spring 1846, age 19. There, in addition to studying Theology, he continued to study Mathematics. He attended lectures given by possibly the greatest mathematician in history – Carl Friedrich Gauss. Gauss was almost 70 years old. Earlier in his life he had hated teaching, but, as his fame had grown, increasingly talented students had come to Göttingen to study mathematics, and Gauss had begun to enjoy teaching them. After much soul-searching, Riemann decided he would rather be a mathematician than a pastor. He would never, however, do anything to disappoint his parents so he requested their permission to major in Mathematics. This was given. After two years at Göttingen, Riemann concluded that Gauss and the other lecturers were teaching a rather unspectacular curriculum. He wanted to hear from lecturers who were active at the frontiers of mathematics. Riemann transferred to the University of Berlin for two years, where he was taught by a number of illustrious mathematicians including Carl Jacobi, Lejeune Dirichlet, and Gotthold Eisenstein. Eisenstein was only three years older than Riemann, and they enjoyed each other’s company. Sadly, the brilliant Eisenstein was destined to die of tuberculosis at the age of just 29. 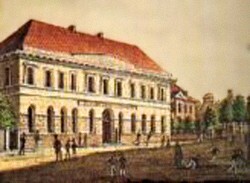 In the spring of 1849, Riemann returned to Göttingen to study for a PhD under Gauss. He also studied philosophy and was fascinated by Wilhelm Weber’s physics lectures. Riemann developed lifelong interests in philosophy and theoretical physics. He actually spent over a year working as a physics assistant to Weber. Weber and Gauss were close colleagues; together they carried out brilliant work in electricity and magnetism and invented one of the world’s first telegraph systems. In December 1851, age 25, Riemann got his doctorate in mathematics with a thesis on the theory of complex functions. A prime number is a natural number greater than 1 with no positive divisors apart from itself and 1. The prime numbers: 2, 3, 5, 7, 11, 13, 17, 19, 23, 29, 31, 37,… have been a source of fascination, concern, excitement, amusement, frustration, and pleasure for mathematicians since our ancestors first started thinking mathematically. Over 2,000 years ago, the Greek mathematician and geographer Eratosthenes devised his famous sieve as a means of finding primes. One reason for the love affair is that primes are the natural numbers from which all other natural numbers can be constructed – it’s often said that the primes are as fundamental to numbers as the periodic table is to chemistry. Between 1 – 100 you will find 25 prime numbers. Between 901 – 1000 you will find 14 prime numbers. Between 9,901 – 10,000 you will find 8 prime numbers. These observations represent a relentless trend. As we count to ever higher numbers, prime numbers become rarer. They never disappear though. Euclid furnished us with a rather simple and beautiful proof that there is an infinite number of primes. Another crucial property of primes is that they seem to be scattered randomly among the natural numbers. There is no formula to predict when the next prime will show up, and they continue materializing apparently at random for as long as you care to continue counting. Gauss had been fascinated by this question. He spent many hours in his youth in intense calculations identifying the prime numbers between 2 – 1,000,000. This was a truly phenomenal piece of work – it is hard to express how overwhelming the sheer scale of calculations required must have been. It was only achievable because the raw calculating power of Gauss’s brain seems to have been close to superhuman. Gauss’s work revealed mathematics in a light people do not often think about. When he counted the prime numbers, Gauss was acting like an experimental scientist, gathering data from which he could draw conclusions. In this case, log x is the natural logarithm of x. The calculation becomes ever more accurate for ever higher values of x. Much of Riemann’s work concerned complex analysis – the realm of complex numbers. These are numbers which have a real part, corresponding to the normal number line, and an ‘imaginary’ part which contains √-1, identified by the letter i. 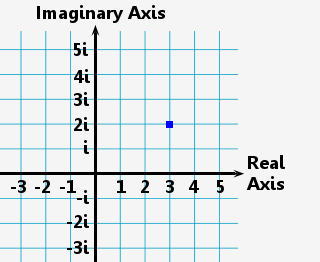 Any complex number can be graphed on the complex plane, with the real part on the horizontal axis and the imaginary part on the vertical axis. For example, the complex number plotted below is 3 + 2i, which is the same as 3 + 2√-1. Riemann attacked the distribution of primes using a mathematical equation known as the Riemann zeta function, which was actually first worked on by Leonhard Euler. Riemann was interested in the zeta function because he noticed it emerged when he was deriving an alternative formula to Gauss’s prime number theorem. Riemann asked himself what values of s would allow the zeta function to equal zero. The answer required complex numbers. His work allowed him to form a hypothesis. His hypothesis was evidence-based, as all of his calculations supported it. All subsequent calculations, using computers to explore ever higher numbers, also support it. Riemann showed that the distribution of prime numbers seems to be profoundly linked to the non-trivial zeros of the zeta function, where the complex number’s real part equals ½. The mathematical magician had pulled a rabbit out of a hat: although everyone had believed prime numbers were distributed randomly, there in fact seems to be some sort of pattern determined by the zeta function’s zeros. But Riemann couldn’t provide a mathematical proof of his hypothesis. This meant he could not prove the zeta function’s zeros and the distribution of prime numbers are linked in all circumstances. Well, at least Riemann didn’t say he had proved it, but there wasn’t enough room in the margin to write it out! Whether the Riemann hypothesis is correct or not has significant consequences for the distribution of prime numbers and for number theory and mathematics. In fact, a large body of published mathematics research relies on the truth of the Riemann hypothesis. If it’s ever shown to be untrue, a considerable amount of back-pedaling will be necessary. In 1900, the brilliant mathematician David Hilbert called on his colleagues to resolve the question of the Riemann hypothesis once and for all. It was one of the famous 23 problems he said must be addressed for mathematics to push ahead successfully. Today, only three serious problems posed by Hilbert still require a solution; one is the Riemann hypothesis. A prize of one million dollars from the Clay Mathematics Institute awaits anyone who can prove or disprove it. Anyone thinking of working on a proof should bear in mind that in 1931 Kurt Gödel published his incompleteness theorems, establishing that some mathematical statements are impossible to either prove or disprove. It’s possible, although unlikely, that the Riemann hypothesis is actually undecidable. In 2016, Kannan Soundararajan and Robert Oliver discovered a modest amount of predictability in prime numbers. If we discard just two numbers, namely 2 and 5, all prime numbers end with a 1, 3, 7, or 9. Each of these possible endings is equally likely. Soundararajan and Oliver discovered that if a prime ends with a 1, the next prime is less likely to end with a 1 than a 3, 7, or 9. 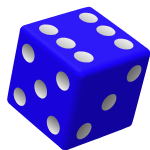 If the primes were genuinely random, this would not happen – just as throwing a 4 on a fair die does not influence your chances of throwing a 4 again. It’s a one-in-six chance each time. The duo probed the first 100 million primes and found only an 18.5 percent chance of a prime number ending with 1 following a prime ending with 1: if the situation were random, the expected value would be 25 percent. They found similar patterns with the 3, 7, and 9 endings. When they switched their scrutiny from base 10 to other bases, again they found similar patterns cropping up. This discovery does not influence the status of the Riemann hypothesis, but it shows that exciting and unexpected breakthroughs are still being made in prime number theory. Eight years before his startling work with prime numbers, Riemann, age 25, got his doctorate in mathematics in December 1851. His thesis considered the theory of complex functions – these are functions in which the independent and dependent variables are both complex numbers. Riemann revealed his discovery of Riemann surfaces, providing a strong link between topology and complex function theory. Riemann could actually have got his doctorate much sooner, but he was slowed by his perfectionist streak. This streak hindered him throughout his career, with the result that he published less than he might have. 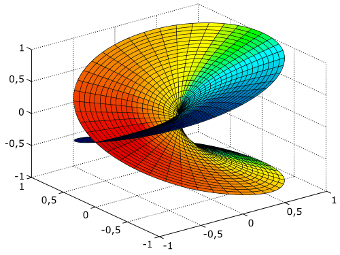 Riemann surface for f(z) = z1/2. Image by Leonid 2. In the summer of 1854, age 27, Riemann completed his professorial thesis and delivered a lecture entitled On the Hypotheses Underlying Geometry. It was one of the most remarkable, far-sighted lectures in the history of mathematics. He began by founding a new branch of differential geometry: Riemannian geometry, the foundation of much of modern geometry. The differential geometry of surfaces was one of Gauss’s pet subjects. Riemann utterly transformed it by making it work in as many dimensions as you liked – 3 dimensions, 4 dimensions, 5 dimensions,… n dimensions. Riemman then addressed the issue of space, discussing what sort of geometry would best describe it. He said the geometry of space when considered on an infinitely small scale could be completely different from that indicated by our everyday experience. In fact, we should suppose an alternative small-scale geometry to be correct if it produced simpler explanations of natural phenomena. Riemann’s idea that we may be unaware of all the dimensions of space sits at the heart of modern string theory, which proposes the existence of, for example, 10-dimensional or 11-dimensional spacetime. The strings in this geometry are active on a scale almost too small to imagine. Mount Everest is nearer in size to a single proton, than a proton is to a string. On larger scales, Riemann said space might be curved so the universe is closed into the shape of a ball. This geometry implies a finite universe in which if you travel far enough in an apparent straight line you end up back where you started, just like an ant walking in a straight line around the outside of a soccer ball arrives back at its starting point. Gauss was present when Riemann delivered his lecture. Usually Gauss greeted new mathematics with the (truthful) assertion that he himself had carried out the same work years earlier. This time, however, he did not. In fact, he expressed both astonishment and excitement to his friend Weber about the depth of Riemann’s new ideas. Although his colleagues at Göttingen were aware of the birth of Riemannian geometry, his lecture was not published formally until 1868, two years after his death. In 1915, Albert Einstein realized that Riemann’s geometry offered the framework for a new understanding of space, gravity, mass, and time – the General Theory of Relativity. With the publication of Einstein’s work, worldwide interest in Riemannian geometry exploded. Its days of being an abstract doctrine loved only by a select group of mathematicians were over. It was suddenly mainstream. To understand gravity as Einstein had done, you needed Riemannian geometry. Sadly, less than a year after he learned about his former student’s new geometry, Gauss died in February 1855. Göttingen replaced him with Lejeune Dirichlet, whom Riemann believed was second only to Gauss in mathematical brilliance. Dirichlet had taught Riemann at Berlin, and his mathematical style had become the principal influence shaping Riemann’s approach to his work. Dirichlet saw to it that the impecunious Riemann was appointed to the position of extraordinary professor. This meant Riemann was paid a small salary and given free accommodation by the university. A Riemann minimal surface. Riemann’s geometry was a new development in the field of non-Euclidean geometry. It established a set of numbers to describe the curvature of a surface occupying any dimension of space. Image by Anders Sandberg. 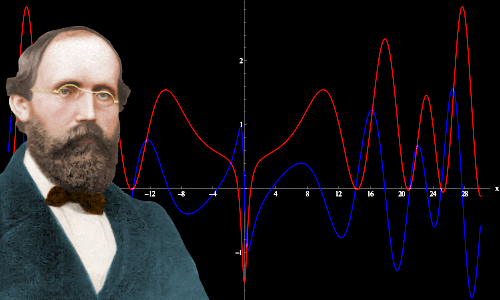 In 1854, Riemann became the first person to rigorously define the integral of a function on an interval. The Riemann integral is a definite integral, meaning that it is the area under an identified section of a curve. It is the integral familiar to students of mathematical methods, applied mathematics, the physical sciences, and engineering. Like Riemannian geometry, the Riemann integral work was not published formally until 1868, two years after Riemann’s death. Riemann never enjoyed good physical health. His whole life revolved around the emotional rock of his family and childhood home in Quickborn. It gave him an immense amount of joy to return there and relive old times in familiar surroundings. The death of his mother and then his father and the subsequent relocation of his siblings removed that rock, upsetting him considerably. Social awkwardness and shyness made it difficult for Riemann to communicate effectively. Very few students attended his lectures at Göttingen. He felt as if the students and his colleagues disliked him. This was not actually true. In 1857, when the strain of work and his impression that nobody liked him grew too much to bear, Riemann retreated to the Harz Mountains suffering from depression. One of his colleagues, Richard Dedekind, who held Riemann in the highest regard, and who actually recorded much of what we know of his life, traveled to the mountains and kept Riemann company, going on long hikes with him until his spirits improved. Usually Riemann addressed bouts of depression by shutting out the world and concentrating on work. In 1859, Göttingen’s chair of mathematics, Lejeune Dirichlet, died. He was replaced by Riemann, who was 32 years old. In 1862, Riemann found the courage to propose marriage to 27-year-old Elise Koch, one of his sister’s friends. Elise accepted, and they had one daughter, Ida, born in 1863. A month after his wedding, Riemann suffered an attack of pleurisy, a painful inflammation of the lungs that, among other things, can be caused by tuberculosis. In his final years, Riemann made several trips to Italy, where the milder climate eased his tuberculosis. Indeed, his daughter Ida was born in Pisa. Riemann enjoyed life in Italy; he loved the artworks he saw there, and he felt more carefree and relaxed than he did in Göttingen. On his final day of life, he knew the end was near. He sat under a fig tree, working on mathematics, and enjoying the view. His Christian faith remained strong to the end. He died just after saying, “forgive us our debts,” while he and his wife Elise recited the Lord’s Prayer together. Bernhard Riemann died, age 39, of tuberculosis on July 20, 1866 in Selasca, Italy. He was buried in Selasca. His friend Richard Dedekind collected Riemann’s surviving papers and published them in 1868, bringing most of Riemann’s work to a wider audience for the first time. Sadly, however, much of Riemann’s research never came to light, because a cleaner, unaware of its importance, burned it shortly after his death. "Bernhard Riemann." Famous Scientists. famousscientists.org. 28 May. 2017. Web. 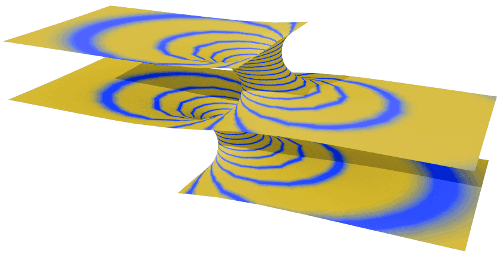 Image of Riemann Surface by Leonid 2 under the Creative Commons Attribution-Share Alike 3.0 Unported license. Image of Riemann Minimal Surface by Anders Sandberg under the Creative Commons Attribution-Share Alike 3.0 Unported licence. Image of Torus and Sphere with Strings by Nina Hernitschek under the Creative Commons Attribution-Share Alike 2.5 Generic license.